SHEBOYGAN, Wis. (AP) - Judith Post says she remains haunted by a memory more than half a century old - the sight of her older sister tossing her own baby several feet and watching the infant land on the floor. Though Post tries to forget the scene, a fresh court case has forced her to confront those thoughts again. 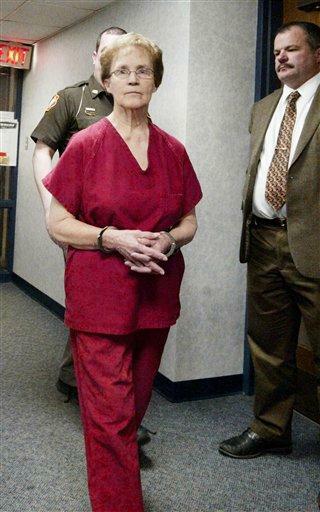 Post's sister, Ruby Klokow, 74, of Sheboygan, pleaded not guilty Wednesday to second-degree murder in the 1957 death of her daughter, after her son came forward to police in 2008 with stories of horrific childhood abuse. A judge determined there was enough evidence for her to stand trial after a preliminary hearing at which Klokow appeared in a red prison jumpsuit. Post, 69, isn't sure how to react to the allegations. She told The Associated Press that Klokow regularly abused her when they were children, and she said she once watched Klokow toss her baby daughter Jeaneen to the ground. It's not immediately clear how that alleged incident might relate to Jeaneen's death. "How do I feel about how she should be punished? I don't know," Post said, pausing for a moment and taking a deep breath. "That's up to God." The case is proceeding now because of James Klokow Jr. The 55-year-old went to police with stories of his mother regularly beating him, choking him and kicking him in the legs with steel-toed boots so often that he still has knee problems. He spoke of his mother breaking his arm and nose. He said she once forced him to stay in the basement for so long that he quenched his thirst by lapping water from the floor. He also described his mother covering the head of his mentally challenged younger brother and striking the wailing boy's toes one by one with a hammer. Another of Ruby Klokow's children, Scott, was found dead in his crib seven years later under circumstances that are unclear; no charges were filed in that case. In Jeaneen's case, an autopsy found she suffered two brain hemorrhages, a partially collapsed lung and three scalp bruises. A forensic pathologist who recently reviewed the documents testified during the preliminary hearing and said the severity of the injuries was not consistent with Klokow's explanation. Defense attorney Kirk Obear, who said he volunteered to represent Klokow at no cost because he was so intrigued by the case's unusual circumstances, suggested he would challenge the idea that current medical authorities are reaching new conclusions without seeing the original evidence firsthand. "I can see where, in trying to solve the case, so many conclusions can be drawn," he said. Post described for the AP how when she was a child, Klokow often tied her and four other siblings to chairs and slapped them. She also recalled a night when she had been baby-sitting Jeaneen and her sister and brother-in-law came home drunk, arguing loudly. She said Klokow tore Jeaneen out of her arms and tossed the baby a few feet toward her husband, saying something to the effect of, "Here, catch." The husband, who died in 2009, made no effort to catch the baby, Post said. Post said she never otherwise witnessed her sister abusing her children. According to the criminal complaint, Klokow told investigators in January that Jeaneen had fallen 16 inches off the couch but later admitted to being "a little rough" with the baby. She eventually said she had thrown Jeaneen against a sofa, where the baby bounced off and hit the ground, the complaint says. Klokow also admitted causing the infant's death and told investigators she was sorry, according to the complaint. "Without her statements, her explanations, we probably wouldn't have this case," prosecutor Joe DeCecco said. "A central part of the case is her admission." However, Obear questioned the circumstances under which Klokow was asked about, and allegedly admitted to, something that happened five decades earlier.